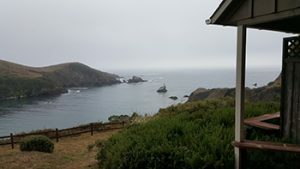 The Branch held an event on September 20th on the Mendocino Coast of California which began with 19 members and guests stopping at Goldeneye Estate Winery in Anderson Valley for a tasting of Pinot Noir, estate grown as well as from vineyards owned nearby. After the visit, the guests convened at Navarro Vineyards just up the road for a picnic lunch accompanied by wines from Navarro, long known as a gem of family owned and vented gewurztraminer, rieslings and chardonnays, as well as noted red varietals. On to Albion, the group arrived to check into the Albion River Inn. 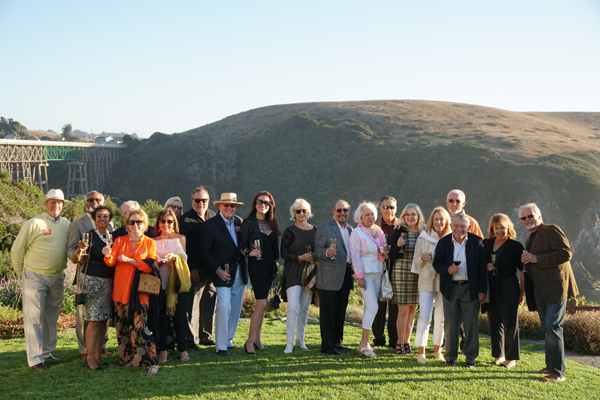 The weather was spectacular and all enjoyed the reception on the bluff overlooking the Pacific and a dinner by James Beard award winning chef Stephen Smith with Mendocino wines chosen by sommelier Mark Bowery. The group found the pairings to be very successful. Photograph of Members and Guests in Front of the Famous Albion Bridge, last timber bridge on the California coast and on the National Registry of Historic Places.